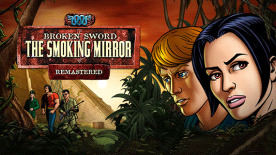 ‘Broken Sword: The Smoking Mirror – Remastered’ is a stunning update to the multi million-selling original. While investigating a ruthless drug gang, journalist Nico Collard unexpectedly comes across an ancient artifact. Little can she know that the ornately carved obsidian stone will lead her, and her adventuring companion George Stobbart, into a mysterious escapade of intrigue and deceit, in which they must overcome powerful forces and antagonists who will stop at nothing to fulfil their evil ambitions.